Then, on April 29th, 1992, the delicate façade came crashing down. The four LAPD officers charged with assault and use of excessive force in the beating of motorist Rodney King received a full acquittal. Immediately thereafter, the long-simmering anger of Black Angelenos boiled over into the streets. Everything culminated in a full scale riot that lasted six days. When the dust settled, nothing had changed. Politicians made empty promises while city government made half-assed concessions. In such a climate, a film like Menace II Society would be seen as socially irresponsible. Tyger Williams’ manager became the first of many dissenting voices. He refused to send the screenplay out to anyone. 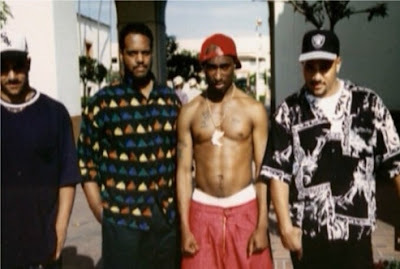 The Hughes Brothers (Far left and far right) with Tupac (Shirtless and wearing jewelry). The “roadie” in question was an east coast transplant with a turbulent past. Though He was a native of Harlem, NY, Oakland had always been his spiritual home. His mother, Afeni Shakur, was a member of The Black Panther party in her younger days. She was eventually tried by New York State as one of the “Panther 21.” She met fellow Panther Bill Garland (A member of the Jersey City chapter) at a “strategy officer’s meeting.” The resulting love connection brought Lesane Parish Crooks into the world. Lesane’s name was later changed to one with historical significance: Tupac Amuru Shakur. The world would come to know him simply as 2Pac. 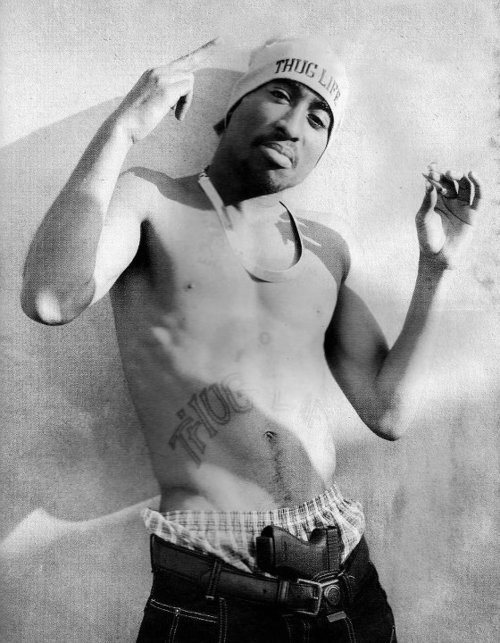 Tupac’s childhood became increasingly unstable as his mother struggled with drug addiction. At age 13, he moved to Baltimore, MD. There, he attended the Baltimore School for the Arts. Acting, poetry, and dance became a part of his repertoire. Had he remained in Baltimore, he might’ve become a true renaissance man. Alas, two years later, he was shipped off to Marin City, CA. While there, he formed a rap group called Strictly Dope. Atron Gregory signed the group, and introduced Tupac to Digital Underground. The rest, as they say, is history. Tupac (Lower right hand corner) with Digital Underground. By the time the Hughes Brothers got to know Tupac, he was enjoying his first taste of true celebrity. He was featured guest on Digital Underground’s 1991 single “Same Song.” Though catchy, his verse didn’t belie the early makings of a superstar. It was fairly light hearted, containing none of the emotional complexity he would eventually come to be known for. After becoming friends with Allen Hughes, Pac commissioned the twins to make a couple of videos for him. The first was “Trapped.” The Second was “Brenda's Got a Baby.” They were the first two singles from his 1991 debut LP 2Pacolypse Now. In hindsight, the pairing of Tupac and the Hughes Brothers should have been a match made in heaven. Unfortunately, the Universe had other plans. Around this time, producer Darin Scott had been working on a project with New Line Cinema. It never materialized. However, he had another ace up his sleeve. By serving as producer on the video for “Brenda’s Got a Baby,” he’d developed a relationship with the Hughes brothers. After reading the script for Menace, he passed it on to Robert Shaye, the head of New Line Cinema. Shaye put it into “weekend reading.” When he finally got around to reading it, he was reportedly driven to tears. Just like that, Menace II Society had found a home. In hindsight, it was inevitable. New Line had become a haven for Black cinema. They’d already released films such as House Party (1990) and Deep Cover (1992). Alas, it wouldn’t exactly be smooth sailing from that point on. New Line agreed to make the film under one condition: A platinum recording artist had to be cast as the lead. This had become standard practice for Black films in the wake of New Jack City and Boyz n the Hood. Allen immediately thought of Tupac. It was a rather odd choice, given that Pac wasn’t a platinum recording artist at the time. 2Pacalypse Now took more than three years to be certified gold by the RIAA. (His 1993 sophomore album, Strictly 4 My N.I.G.G.A.Z., faired a bit better. It achieved that same milestone within months of release.) Shakur had ample street buzz, but he hadn’t yet broken through to the mainstream. Never the less, Allen chose him for the lead. While certainly in keeping with the film’s vision, Allen’s casting choice would have drastic repercussions. CLICK HERE TO READ PART IV!